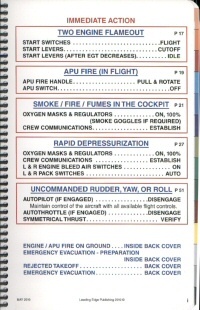 Quick Reference Guide (QRG) describing Emergency & Abnormal Procedures (“non-Normal”) for the 737-700/800. For study/training only. NOT to be used in the airplane. Approximately 120 pages. NO TABS. Coil bound. Performance Section is not as long as airline QRG.